There are some very active geothermal fields around Hveragerdi (correctly Hveragerði), about 45km southeast of Reykjavik, Iceland. 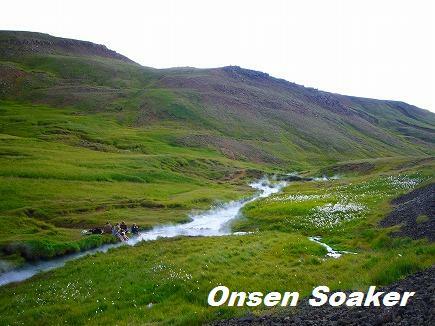 A friend of mine and I enjoyed hiking to the hot spring river of Klambragil north of Hveragerdi in early August. The hot spring was too hot to soak, we had to look for a soakable spot. We found the river water joined hot spring, and downstream of the joining point was soakable at 42 - 43°C. We met many travellers mainly from Continental Europe in the afternoon. The entrance of the hiking trail located north of Hveragerdi. There is a car park at the entrance. You can see hot spring steams from the entrance gate. Be ware of boiling hot springs, especially if you go with your children as there are no fences arounnd the gushing spots. We found this "Danger" signboard (even with Japanese word "危険", German and Italian?, too) in the area no hot spring was gushing. I heard the hot spring gushing points changed dramatically after the magnitude 6.2 earthquake hit the area on May 29, 2008. The hiking trail was well marked with red & yellow painted sticks. It's rather easy walk without sharp ascend or descend. It took around an hour to the hot spring river. We had to cross the river on the way. I took my shoes off for walking in the river. People in the picture came from Colombia. There was hardly any path between the hiking trail and the hot spring river, we walked too far. The view is amazingly beautiful! Nice shots! Well, I traveled with three friends of mine, and none of them're soak addicts like me and our main targets weren't hot springs. So I went this hike with other Japanese before joining my friends. But of course I enjoyed travel with my friends. The pure nature impressed us so much, and all Icelandic people we met were very friendly and helpful. I flew first to Los Angels, then to New York, staying overnight there, then finally to Reykjavik, so far away, but my trip was rewarding. Can you get to these hiking trail by foot from Hveragerdi, or do you need a car? Thanks!